Long Chiffon rhinestones hijab,comfortable and breathable. 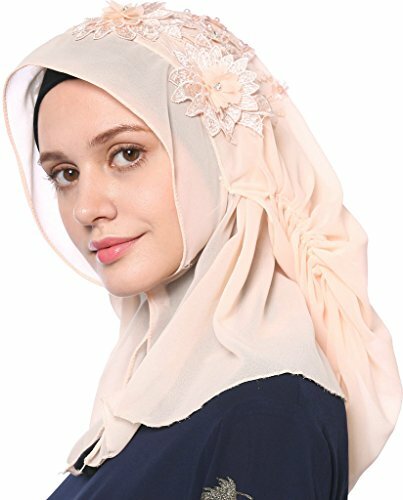 This hijab is designed for Muslim,Indian,or daily decoration. Just buy it and bulid your own style. YI HENG MEI-Focus on high grade fashionable muslim apparel. Material: Soft Chiffon. Comfortable breathable and stretchable,friendly to skin and not fade off. Size:The longgest behind length is 22 inch / 55cm. One size fits most. Three press buttons on neck which can be controled is more convenient and suitable for daily look. Features:New style rhinestones hijab. this Brief and classic design shows your charming temperament.Seamless,lightweight and stretchable fabric keep you comfortable in any position.Our design is all for you. Package Include: 1 Hijab/Hand wash or machine wash, cold, gentle cycle. Dry flat or hang to dry. Do not bleach./Generally speaking, the postman will deliver your parcel in/at your mailbox.Pls check your mailbox first, any problems about delivery, feel free to contact us first.